Greece was handed an inviting draw for UEFA Euro 2020 qualifying, placed in Group J alongside Italy, Bosnia and Herzegovina, Finland, Armenia, and Liechtenstein. Ahead of the draw in Dublin, Ireland, optimism was low among Greek fans after the Ethniki Omada was placed in Pot 4, however, luck was on the country’s side. There was a possibility that Greece could play the likes of Spain, Germany, and Serbia, but instead, the Galanolefkoi were drawn against Italy, Bosnia and Finland from the first three pots. Armenia (Pot 5) and Liechtenstein (Pot 6) make up the group. 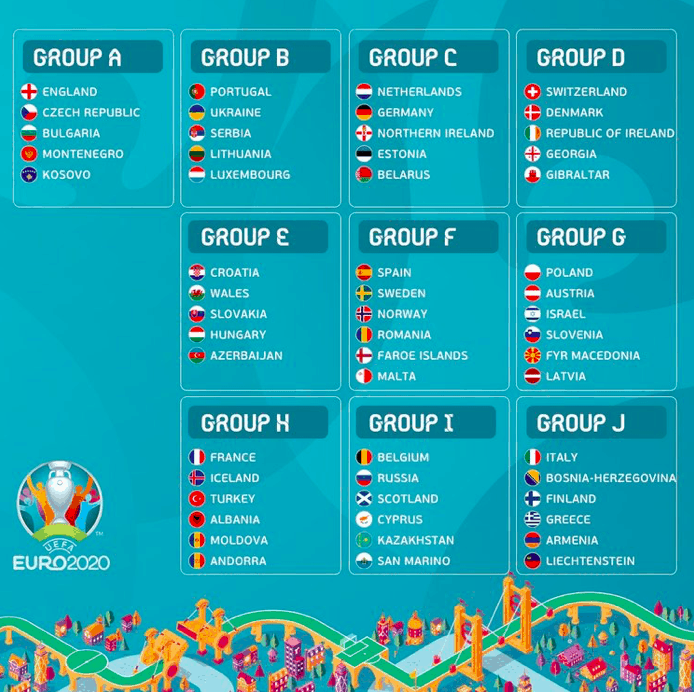 The full schedule for Group J in UEFA Euro 2020 qualifying will be released in the near future. All qualification matches will take place between March and November 2019. The Italians are theoretically the strongest team in Group J having arrived from Pot 1. Traditionally regarded as a superpower, Italy won the FIFA World Cup on four occasions (1934, 1938, 1982, 2006) and the 1968 European Championship, however, the proud country surprisingly failed to qualify for the 2018 World Cup after losing to Sweden in the qualification playoffs. Although they can never be underestimated, the Azzurri are not the force they once were, and they don’t possess star names such as Francesco Totti and Alessandro Del Piero anymore. In the UEFA Nations League, Italy finished in third place of Group 3 with five points in four games against Portugal and Poland. These two countries know each other well. In qualifying for the 2018 World Cup, Greece snatched a dramatic 1:1 draw against Bosnia in Piraeus, before claiming a valuable 0:0 tie on the road. The Ethniki finished in second place of the group ahead of the Bosnians, and you can bet the latter have revenge on their minds. In Group 3 of League B in the Nations League, Bosnia earned promotion to League A, defeating Austria and Northern Ireland. Former AEK defender Ognjen Vranjes is a key member of their squad while their main stars as Miralem Pjanic and Edin Dzeko. Here we go again. This autumn, Greece didn’t enjoy a lot of success against Finland in the Nations League, dropping a crucial 0:2 loss in Tampere which allowed the hosts to claim promotion to League B. In Athens, the Ethniki did win 1:0, but that result was enough for Finland to win the group. Norwich City striker Teemu Pukki is tough for opposing defences to handle and ex Panathinaikos midfielder Robin Lod provides creativity going forward. Interestingly, the Finns have never qualified for a senior European championship. Without doubt, the standout name on the Armenian roster is 29-year old attacker Henrikh Mkhitaryan, who is on the books of English giants Arsenal. Nevertheless, asides from Mkhitaryan, there aren’t many top level players in the side and Armenia even lost to Gibraltar in the Nations League. As an independent nation, Armenia haven’t competed at the European Championship or World Cup. One of the true minnows of European football. Nowadays, it isn’t that easy to thrash Liechtenstein, however they are the weakest team in Group J and will be expected to prop up the rear. In the Nations League, Liechtenstein finished in fourth place of Group 4 of League D behind FYROM, Armenia and Gibraltar. AGONAsport.com is an English based website for Greek sports fans across the world. The website launched this year and was created by Sarantos N.Kaperonis, an avid Greek American sports follower. The goal of AGONAsport Online is to provide a website, in English, that focuses exclusively on Greek Sports. GCT is now teaming up with AGONA to bring you all the latest in sports news.